Talk of tariffs has dominated the news over the past few months – both on what the U.S. may do on its exports to China and what China may do on its exports to the U.S. The report gives us a look at what products or industries would be most affected by those tariffs for the U.S. consumer. 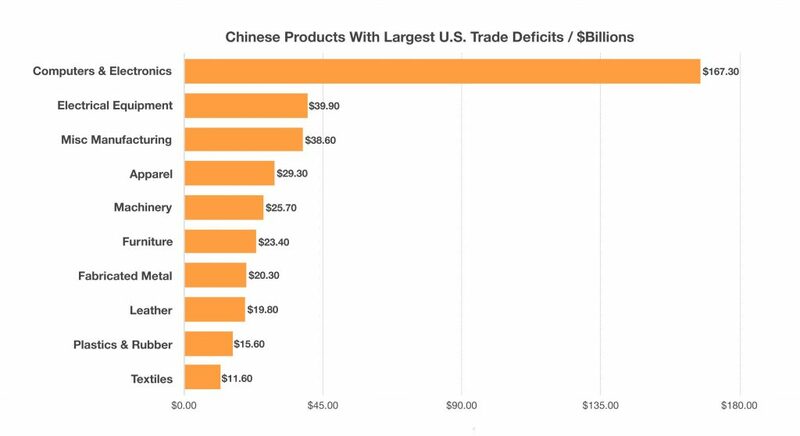 Electronic devices and computers are the products with the largest trade deficits with the U.S. Over the past few years, American consumers have become accustomed to inexpensive Chinese made products available in every retail and online store across the country. One of the biggest casualties of the imposed tariffs are auto manufacturers located in the United States. Ironically, there are currently 10 foreign auto manufacturers with plants in the U.S. compared to only two U.S. owned auto manufacturers. These manufacturers all rely on components primarily imported from Asia and China whose controlled costs are critical to the profitability of the companies. A list of 1,300 identified products imported from China are primarily used as components for larger more expensive products. The question is what percentage of these products are comprised of imported components subject to tariffs. Foreign manufacturers have skirted tariffs and manufacturing rifts over the years by having certain products assembled in the United States, but comprised of imported components. Hence the controversial tag noting “assembled in the USA”, which many consumers and consumer groups have found to be misleading.